Tomorrow is Thanksgiving and as I reflect on the past year, I am extremely thankful. I have a wonderful family, great friends, and I am an advocate for a part of a very dynamic celiac community. My health, while not perfect, is better than it has been and I have a good job with excellent health benefits that allow me to follow-up with specialists when I am sick. 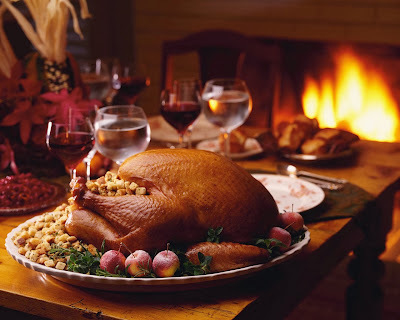 Being 2013, I thought I would list thirteen things I am thankful for this Thanksgiving. I am thankful for a family that fully supports my Celiac Disease and for a sister that has it too! Our Thanksgiving table will have 5 out of 8 people eating gluten-free; 5 out of 8 people (not the same people) who are dairy-free; and three gluten-eating folks that support us and love us no matter if there are Silly Yaks at the table! Read about my Celiac sister here. I am thankful for my friends who don't think me asking to eat at gluten-free friendly restaurants is weird anymore. They usually let me choose where we eat and make sure if they choose, there is something safe for me to eat wherever we go. I am especially thankful for my #GFF (gluten-free friend) Kristen who has crossed over from Meetup member to a great friend who invites me to free trips to Atlantic City and goes to the Pink concert with me (2 more weeks). WOOHOO! Read about my #GFF Kristen here. I am thankful that I have the means and guts to travel the world. This year, I went to Portland (Oregon) four times for work, went to Wales and Scotland with my mom for ten days, and took a solo trip to Thailand right before my 35th birthday. I rode elephants, pet tigers, and met some amazing people from around the globe. I pushed myself beyond my comfort zone, left my comfortable surroundings in NYC for two weeks, and seriously had the adventure of a lifetime. Here are pictures from my Thailand adventure. I am thankful I was diagnosed with Celiac almost 33 years ago. I am thankful for my early diagnosis and a really progressive (and young) resident who recognized all the way back in 1981 that I had Celiac disease which could be controlled by a gluten-free diet. Read my Celiac story here. I am thankful for the amazing community I lead here in the big apple, NYC Celiac Meetup group. I have been part of this group for more than 8 years and this group officially turned 10 years old in October. The group has grown to more than 1700 members and I feel lucky to be the lead organizer of such a dynamic group of gluten-free people. Click here to join the NYC Celiac Meetup group. Membership is free! I am thankful for social media. It is through Twitter and Facebook and commenters on this blog that I have met some amazing people. I am always so flattered when a fellow blogger wants to meet in person. It's like a gluten-free blind date when I meet up with these people, but we never fall short of things to talk about. I feel honored they want to connect with little ol' me. Recently, I got coffee with Heart of Queens and had an amazing dinner with Winning Without Gluten. Check out their blogs! I am thankful that I have been a part of some great fundraising efforts for the Celiac community. Every year for the past few years, I have been a part of the Paul Taylor Dance Company fundraiser for the Celiac Disease Center for Columbia University. This is a beautiful, cultural event with a gluten-free pre-party now being held at Lincoln Center in NYC. Buy your tickets now for the 9th Annual Paul Taylor Dance Company event in March 2014! 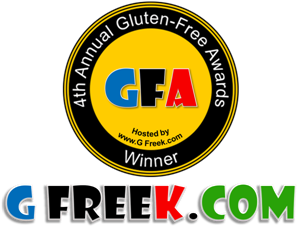 I am thankful to be nominated for the 4th Annual Gluten-Free Awards at GFreek.com in two categories this year. I am also thankful I got to meet the founder of the awards, Josh, and his entire family after he ran the NYC Marathon this November. Go vote today. Vote for me and I will be extra thankful! I am thankful for all of the amazing research that is being done on Celiac Disease by experts from around the globe. We are getting closer to understanding celiac, but we still have a long way to go. Read up on research here. I am thankful for the FDA finally passing some gluten-free labeling regulations that will help keep me and my fellow celiacs safe! By giving definition to gluten-free, this will force companies to start adhering to these regulations or take the words gluten-free off their labels. Read more about the FDA gluten-free rulings here. On a related note, thank you to all of the restaurants that provide me with safe, gluten-free meals. I love to dine out and I am so thankful for the restaurants that keep me safe. I have gotten to know some really wonderful chefs over the past few years. These chefs who not only try to cater to the gluten-free customer, but do it deliciously are my celebrities! Enjoy some of my favorite restaurant reviews here. I am thankful for this blog and my travel blog, Gluten-Free Globetrotter. Being able to write these blogs, share my opinions openly with the world, and connect with readers has been amazing. This blog is fun at times, a hassle at times, and therapeutic at times. This January, my blog will be seven years old. This is ancient in terms of gluten-free blogs. I am also thankful for all of the amazing bloggers that are out there. There are too many favorite bloggers to mention but you can read about a recent gluten-free bloggers dinner in NYC here. Most importantly, I am so thankful for you all. My dear readers, you have kept me writing this blog for almost seven years. Your comments, your emails, your Tweets and Facebook comments, and your support mean the world to me. THANK YOU ALL! Some of my favorite bloggers have been putting together a list of their best gluten-free Thanksgiving recipes. I am drooling looking at their photos and recipes. While my gluten-free family menu is already set, these recipes provide some really great inspiration. The 4th Annual Gluten-Free Awards are in full swing at GFreek.com. I am honored to be nominated for both "Best Gluten-Free Website" and "Best Gluten-Free Blog." This is a great honor to be nominated for the fourth year in a row and I am in good company with the other nominees. I won the award for Best Gluten Free Website, Blog or Social Site in 2011 and would love to win again in early 2014. Best Gluten-Free Website is category #15 on the second page of the survey. I would love if you voted for this blog, Gluten-Free Fun, today and daily until the polls are closed. Best Gluten-Free Blog is category #17 on the second page of the survey under Erin Smith's Gluten-Free Fun! It has been quite a crazy week in the celiac community. It all started with a press release from the Celiac Sprue Association recognizing Omission Beer by giving it the CSA Recognition Seal. It continued with my posts and follow-up responses from the CSA which, in my opinion, only made things worse and the community more convinced. And it is ending with me giving a summary of links from this week. I think this story is far from over, but I would like to put my involvement to rest for a while. The Facebook comments are starting to become offensive; the emails of people who are too afraid to comment publicly are becoming combative; and the tweets are obviously showing that I have pissed off a number of people. I would like to reiterate that my initial post and subsequent posts have been my opinions of why I do not support to endorsement by the CSA and not about me telling you not to drink Omission Beer. Yes, I am sure I lost a few readers and Twitter followers this week but I am fine with that. I did my research, presented both sides of the story, and never once told you not to drink Omission Beer. I was fair from start to end and for that I owe no apologies. I think the most ironic part of this mess is that I am currently in Portland, Oregon, home to Omission Beer for this entire week. Sigh. And with that, I would like to toast the end of this story for the time being... CHEERS! Today, I received two emails from Mary Schluckebier today based on my previous post about my confusion over the the CSA endorsement of Omission Beer. The first email was in response to my letter to the Celiac Sprue Association Board of Directors. Mary's responses are in red font. I saw your press release about your endorsement of Omission Beer yesterday followed by an onslaught of Tweets, Facebook posts, and blogs both supporting your endorsement as well as objecting your endorsement. As a lifelong Celiac, I find your endorsement of a product that is derived from gluten very troubling. I have maintained a gluten-free diet since 1981 and the CSA was the very first organization to support my family after my diagnosis. For you to now come out and not only support a product that is made from gluten but to also contradict your very own definitions of gluten is confusing and disappointing. "CSA materials encourage everyone to develop their own definition for gluten-free. For the CSA Recognition Seal there is a definition. When you were diagnosed there was no other management than to eliminated products from the prohibited grains. Now we have DNA and amino acid sequencing of proteins from many varieties of the grains. The celiac toxic fractions of the grain storage proteins are being identified. So now we know it is not the entire grain that must be eliminated. More of these products will be coming into the marketplace labeled gluten-free either in the US and already in many other countries." The page I continually refer to is the "Defining The Term Gluten Free" page which is linked directly from the CSA homepage. Interestingly, this page has been updated in the hour it took me to put together this post. I also received this follow-up email also from Mary Schluckebier today. CSA supports celiac disease management as an exercise in constant risk assessment and personal decision-making. “Risk-free” standing alone in the headline was confusing since CSA Recognition Seal designates the most risk-free choices in the marketplace. Few things in life are risk free. The final FDA definition for products labeled gluten-free opened up some options that are likely to be more confusing in the marketplace. Our random checking of products will likely lead to more ways to communicate the findings. Tell us what you are including in your food plan? Members of the Celiac Sprue Association know that CSA encourages meaningful, verifiable innovation in widening the options of products suitable for the celiac diet. Qualifying for the CSA Recognition Seal for Innovative products has more steps than qualifying for the naturally gluten-free category. In the process CSA gathers and shares information with governmental agencies, including the TTB, USDA and FDA, education based researchers, innovative industrialists and most important the CSA members. I'm sorry to say but I find this response weak. Mary clearly states below that the "CSA does not endorse any product" while their press release says "Celiac Sprue Association Recognizes Omission Beer as Risk-Free for Celiacs." The Google dictionary definition of endorsement is "an act of giving one's public approval or support to someone or something." In addition, I feel that Mary gives a CYA (cover your a$$) statement by saying "Few things in life are risk free." This email doesn't do much for me except for me to reiterate my initial confusion over their "recognition" (ahem) of their "endorsement" (cough) of Omission Beer. Celiac Sprue Association, you are endorsing, recognizing, publicly supporting, whatever you want to call it Omission Beer with your CSA Recognition Seal and your press release to the world. It doesn't matter what words you use because you are putting your stamp of approval on this product as "risk-free" for Celiacs even though it contradicts your definition of gluten-free, specifically requirement # 4. I appreciate the Celiac Sprue Association making a statement and allowing me to present this information to my readers, but I still do not support their decision to put the CSA Recognition Seal on this product. I would also like to point out that NEVER once did I tell my readers not to drink Omission Beer. I've received some nasty emails, Facebook comments, and Tweets this past week that told me I cannot tell others what to eat or drink. Throughout the week, I have simply presented the facts and information sent to me from the Celiac Sprue Association as well as highlight public information that is available on their website. As with any product, restaurant review, etc. I put up here on my personal website, it is up to you to make your decisions as someone living with Celiac what goes into your body. Your Celiac is NOT my Celiac and I have never claimed it to be. I am excited to share two gluten-free options for your Thanksgiving meal in New York City this year. I've had dinner at both restaurants and can assure you that you are in great hands for your turkey day meal. Even though I never ate out at a restaurant on Thanksgiving, I know this option is quite popular for New Yorkers who do not want to cook. This is also a great option for people coming to New York City for the Macy's Thanksgiving Day Parade who want a traditional gluten-free Thanksgiving dinner. Don't delay, make your reservations today! This morning, I wrote to the entire executive board of the Celiac Sprue Association in response to their endorsement of Omission Beer. You can read my post with links here with links back to the TTB and FDA labeling rulings. A few hours later, I received this email response from Mary Schluckebier, the executive director of the CSA, about their endorsement. Erin, Thank you for the opportunity. I will get a better statement to you tomorrow. This is and example of innovation and research working. Over the past year CSA received Omission’s application and has considered, gathered information and research from outside of the brewery and from Omission. We have worked with the TTB. It was somewhat of a surprise that they would be able to earn the CSA Recognition Seal. I will have some additional statements for you tomorrow. When the known barley celiac toxic amino acid sequences of the proteins that were in the beginning ingredients are absent as validated by beginning and ending mass spectrometry that represents a product that has been rendered non-celiac toxic. Mathematically, this would place the product below 5 ppm. Well, this is confusing. Mary admits that it is surprising that Omission earned the CSA Recognition Seal and that they need a stronger statement. I look forward to further statements from the CSA and will post to my readers as soon as I have it. How could Omission Beer, made with malted barley, be certified to bear the CSA Recognition Seal if barley is one of the forbidden grains? We have very strict standards for earning our Recognition Seal, and Omission beers clearly meet those standards. Omission beers have undergone mass spec analysis which we carefully reviewed and the analysis showed that the protein remaining in the product is free of known celiac toxic fractions. To further validate that the enzymatic process eliminates the celiac toxic fractions, the Competitive ELISA testing methodology is used on each batch which consistently shows no detectable gluten. Previously CSA would not offer its certification to products made from ingredients that contained gluten. What has changed? Are you weakening your standards? Our standards remain as stringent as ever. Indeed, they are tougher than the FDA's new guidelines. We are ‘celiacs helping celiacs’ and we take our mission seriously. What's changing is that innovation in processes for making and testing gluten-free products continues to advance and we take advantage of the tools and information as it becomes available. We encourage innovation because it creates opportunities for more risk free choices, and better quality of life for celiacs and those with gluten related disorders. because, in their view, sufficient scientific validation does not exist for detecting gluten in fermented beverages. Do you disagree? We have reviewed every aspect of Omission production and testing processes. We tested the product independently, as we do every product under consideration for our Recognition Seal, and we further examined the mass spectrometry analysis conducted on Omission, which validated the elimination of known toxic amino acid sequences. In addition, we reviewed documentation of raw ingredient sourcing, allergen control and sanitation plans, training procedures for controlling cross-contamination, and an inspection of packaging materials. Based on our review of all of this information, we are confident in our determination that Omission beers meet our requirements for the CSA Recognition Seal. What's your view of the future of gluten-free designations? disorders, and for their role in advancing scientifically sound gluten detection methods, such as mass spectrometry. The Celiac Sprue Association is a trusted source of information about the gluten-free products consumers rely on and enjoy every day. In keeping with its founding principles, CSA amplifies members’ efforts for good health by encouraging quality nutrition, responsible business practices, scientific research, education, testing and outreach. Public health and food labeling policy solutions continue to develop through a genuine partnership with policymakers and other stakeholders. Contact us through www.csaceliacs.org or celiacs@csaceliacs.org. The CSA also updated their website to include a link explaining the "Interim Policy on Gluten Content Statements in the Labeling and Advertising of Wines, Distilled Spirits, and Malt Beverages" Based on this link, it looks like you can gain a CSA Recognition Seal even if the FDA and TTB cannot label you gluten-free. Well, isn't that interesting. The LAW says you cannot slap gluten-free on your label, but the oldest Celiac organization in the country says "We approve of Omission Beer, drink up!" No thanks Celiac Sprue Association, even if you are buying! This story is far from over. I look forward to hearing what else the CSA has to say. They look to be supporting innovation while putting a sensitive community at possible risk of reaction. I'd like to note that I have gotten a lot of comments and emails today both supporting my post and against my post telling me I am wrong. The intention of my post is to present you the facts as to why Omission cannot legally be labeled gluten-free while giving my opinion about why I think the endorsement by the CSA is poor judgement. Ultimately, it is your personal decision to drink Omission Beer or not. I never once told you not to drink this beer, so please don't email me again and tell me otherwise. Note to readers: I was linking to a photo on the Omission Facebook page. It looks like they took their post down! There was also a press release that made the newswires directly from the Celiac Sprue Association announcing their endorsement of Omission Beer. I struggle tremendously with this endorsement. WHY? Omission Beer is made from gluten. PERIOD. According to federal guidelines, we aren’t legally allowed to claim that Omission beer is gluten-free outside of Oregon because the beer is brewed with malted barley. While the FDA proposed to define the term “gluten-free,” that definition has not been formally adopted by the organization. While Omission beer does contain barley, one of the “prohibited grains” in this definition, all batches are tested by an independent lab using the R5 Competitive ELISA to ensure that gluten levels meet our standards. Although scientific evidence supports the testing, the evidence is not conclusive. All Omission beer test results can be viewed at: www.omissiontests.com. If you are going by the information from their own website, Omission Beer isn't allowed to be labeled gluten-free. an ingredient derived from these grains and that has been processed to remove gluten, if it results in the food containing 20 or more parts per million (ppm) gluten"
This means that technically under the new FDA labeling law Omission can be labeled gluten-free because the ingredient (barley) is processed to remove the gluten to less than 20 parts per million. BUT... The FDA law does NOT apply to malted beverages and beer is a malted beverage. "The final rule applies to all FDA-regulated foods, including dietary supplements. The rule excludes those foods whose labeling is regulated by the U.S. Department of Agriculture (USDA) and the Alcohol and Tobacco Tax and Trade Bureau (TTB). Generally, USDA regulates the labeling of meats, poultry, and certain egg products (FDA regulates the labeling of shell eggs). TTB regulates the labeling of most alcoholic beverages, including all distilled spirits, wines that contain 7 percent or more alcohol by volume, and malted beverages that are made with both malted barley and hops." While we are reviewing this, we would like to remind industry members that TTB Ruling 2012‐2, Interim Policy on Gluten Content Statements in the Labeling and Advertising of Wines, Distilled Spirits, and Malt Beverages, is still in force for alcohol beverage products that are subject to TTB’s labeling regulations under the Federal Alcohol Administration Act." "TTB will allow use of the statement “Processed or Treated or Crafted to remove gluten ,” together with a qualifying statement to inform consumers that: (1) the product was made from a grain that contains gluten; (2) there is currently no valid test to verify the gluten content of fermented products; and (3) the finished product may contain gluten. Because the current tests used to measure the gluten content of fermented products have not been scientifically validated, such statements may not include any reference to the level of gluten in the product. TTB believes that the qualifying statement is necessary to avoid misleading consumers about the gluten content of these products because of the serious health consequences associated with the consumption of gluten by individuals with celiac disease." The very last sentence of this paragraph is what makes the Celiac Sprue Association endorsement of Omission Beer so troubling to me. The TTB, the governing body that can label this beer gluten-free for not, states they do not want consumers with celiac disease to be mislead by malted beverages crafted to remove gluten. As of today, Omission Beer cannot put the words "gluten-free" on their labels yet the oldest national celiac association in the country is putting their stamp of approval and logo on the Omission Beer bottles. It just doesn't makes sense to me! All of the facts show that legally this product is not gluten-free. The Celiac Sprue Association is misleading the Celiac community. CSA Recognition Seal products are tested using the most sensitive ELISA test presently available in the United States. Validation of "free of wheat, barley, rye and common oats" in tests with a lower limit of quantification of 5 parts per million. Company submit the analysis of ingredients and manufacturing procedures (HACCP) to assure the products meet the requirements for the CSA Recognition Seal. "CSA-recognition seal definition: Requirement #4—Ingredients “specially processed to remove gluten”—(e.g. food starch, wheat starch, distilled alcohols and vinegars from WBRO grain sources): Not allowed—with present available commercial methodology the extent or consistency of the processes is not measurable. " I personally think the Celiac Sprue Association made a HUGE mistake endorsing Omission Beer. As of today, Omission Beer cannot legally be labeled "gluten-free" under the current TTB laws. Period. Additionally, if you look at all of the definitions of "gluten-free" on the Celiac Sprue Association website, Omission Beer does not meet those requirements. I have nothing personal against Omission Beer but I now question the judgement of the Celiac Sprue Association with their endorsement of this product that cannot legally be labeled gluten-free. I will also now question all all future endorsements that come from the Celiac Sprue Association. Celiac Sprue Association, you have contradicted your own definitions of gluten-free by endorsing a product derived from gluten. What made you do it? Please rethink this endorsement or update your website immediately to reflect that you now support products that are made from gluten. Come out and support the Celiac Disease Center at Columbia University with R.O.C.K.! 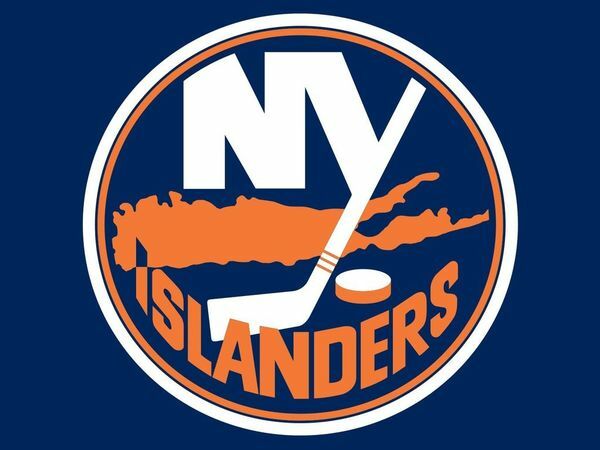 A portion of each ticket will be donated to the Celiac Disease Center at Columbia University. Labels: Columbia University, fundraiser, R.O.C.K. The Kicking 4 Celiac Foundation Student Ambassador program is proud to bring celiac disease awareness to the Hofstra University campus with this great event! The Hofstra University Men’s Basketball team will be playing Manhattan College on Saturday, November 30th, 2013 at 4pm, at Mack Sports Complex on Hofstra’s campus. The student ambassadors and members of the Kicking 4 Celiac Foundation will be present to hand out celiac disease awareness information, answer questions, and represent the Kicking 4 Celiac Foundation for this celiac disease education and awareness event! Proceeds from this event will benefit the Kicking 4 Celiac Foundation and its multiple, national, education and awareness programs! The event will help support the Kicking 4 Celiac Foundation, and their national celiac disease education and awareness programs, which includes the first program to give scholarships to students with celiac disease, a cleats 4 kids program which helps students in underserved areas learn the importance of health and nutrition, and a student ambassador program, that empowers students of all ages to be voices in their communities to raise celiac education and awareness. Tickets will be mailed immediately upon purchase! I am excited that I am one of the NFCA's Gluten-Free Holiday Tips of the Day! There have been twelve great tips so far here will be a new tip every day until the end of November. Last week, I had the honor of hosting a gluten-free bloggers dinner at Tommy Lasagna. There are so many awesome gluten-free bloggers in the New York City area so I was excited to have all of us together. We often dine at the same restaurants, attend the same events, and know the same people but we are rarely all at the same place at the same time. It was Tommy Lasagna's new gluten-free menu that brought us all together. Tommy Lasagna first opened in 2011 when Chef Tommy Mosera decided to take his lasagna to the masses after insistence from lasagna-loving friends and family. When one of Tommy's biggest fans and his restaurant partner's wife was told she had a gluten intolerance, Chef Tommy decided to make it his mission to serve her gluten-free food at his restaurant. According to Chef Tommy, it took six months to get the gluten-free pasta recipe down pat and I can honestly say his hard work paid off. Using Bob's Red Mill in some pastas and Cup4Cup for lasagna, Chef Tommy's gluten-free chemistry shines bright in his delicious house made lasagnas, pastas, and breads. When I first spoke to the chef on the phone to plan our gluten-free bloggers dinner, I asked him my usual rapid fire "do you know gluten?" question. Chef Tommy answered all of my questions about cross-contamination, ingredients, flour in the air, and more. It was obvious that he wasn't giving me lip service but truly understood the needs of his gluten-free customers. In order to try his best to avoid cross-contamination in the kitchen, all of the gluten-free pastas are made early in the morning (after a thorough nightly cleaning the night before) in a dedicated Kitchenmaid. When cooking the pastas, Chef Tommy makes sure all of the pastas are boiled in their own pots with clean water. Chef Tommy did warn that this is a gluten-filled kitchen so there could be airborne contaminants but they do their best to serve gluten-free meals safely. I appreciated his honesty and felt comfortable moving forward with the bloggers dinner. I did warn Chef Tommy that gluten-free bloggers (or any gluten-free/celiac people for that matter) are very critical of their meals and can get sick easily, but he didn't see a problem and welcomed us warmly. When I arrived at Tommy Lasagna, it was great to see familiar faces like Anya, Carolyn, Judith (the only non-GF blogger), Katie, Kristen, Mike, and Molly and to finally meet Candice in person. We all made our introductions and quickly started chatting like old gluten-free friends. Chef Tommy and waiter Zach came over and greeted us, walked us through the beverages for the meal. The chef asked if we had any additional allergies and because with celiac there is always something else, we all piped up with our other intolerances and allergies. Chef Tommy paused for just a moment before saying "No problem!" This is when his staff started started serving the food. And serving and serving. Yep, they kept the food coming all night long with six gluten-free courses! Not one, but two gluten-free lasagnas to try! I ate so much, I am not even sure I can remember everything but I do remember foccacia, a caprese salad with olive oil and tomatoes, a pear and pine nut salad with goat cheese and arugula, two different lasagnas: a garden vegetable lasagna and a bolognese lasagna, fettuccine with vodka sauce and one with bolognese sauce, the most AMAZING crispy chicken with hash browns and Brussel sprouts, and then not one but TWO desserts: flourless chocolate cake and cheesecake. If I didn't tell you we rolled out of that restaurant stuffed to the brim, I would be lying. Chef Tommy went above and beyond my expectations and his gluten-free menu launch was a big hit. Here are some of the other blogger write-ups from the Tommy Lasagna Gluten-Free Menu launch night. Gluten-Free Blondie: That Time I Ate Gluten Free Lasagna in an Otherwise Normal Restaurant. This made me skeptical. Screen out gluten??? Why not produce products with no gluten at all? There is also a list of products formulated without gluten but again they do not call their products "gluten-free". I was getting confused so just like with the BabycakesNYC debacle, I decided to go to the source. The response from Arbonne took a while (multiple tweets, emails, and customer service inquiries via their website) but I finally got one. It is lengthy but at least they are transparent and seem to understand PPM which is more than most companies. Thank you for your email. We appreciate your inquiry regarding Arbonne products and ingredients. I will be more than happy to assist you. All Arbonne products are formulated without gluten. While there are ingredients in the products that have names that would indicate they contain high amounts of gluten this is not the case. We do understand the confusion as individuals with gluten intolerance, celiac disease, etc. are told to avoid ingredients such as wheat, barley, oats, etc. ; however, the ingredients used in our products can go through many different types of processing before they are ready to be used in topical products. The final ingredient, despite the fact of coming from common sources of gluten, does not have a detectable level of gluten. We have submitted products with ingredients that come from well-known gluten sources for testing, and have confirmed that gluten is not detectable in the products. The ingredients from natural gluten sources go through an extraction process to remove the gluten; therefore gluten is undetected at below 0-2 ppm which allows us to label it gluten-free. Our products are tested to ensure that gluten is undetected and our facilities are sterilized before any batch productions are implemented. Arbonne is a global company and we develop and manufacture based on a global perspective. When it comes to gluten statements (and others, such as Kosher), there is not a global benchmark across all four countries Arbonne does business in. Arbonne products are formulated without gluten and in the U.S., for example, that means formulated with “less than 20 parts per million.” When determining the ppm for gluten testing, one method we commonly use at Arbonne is the ELISA Test. It is an antibody-antigen test. Some Essentials products are made in a facility that processes milk, eggs, tree nuts, soy, and wheat and have that warning label on the packaging. While these Essentials products are required by our manufacturers to have a warning that indicates that the products are manufactured in a facility that also manufactures product containing these ingredients, we would not say that the facilities are, “contaminated”. All of our manufacturers have stringent SOP (Standard Operating Procedures) for the cleansing and sanitation of the machinery between productions. Additionally, all of our manufacturers are audited by Arbonne as well as other regulatory agencies like the FDA for compliance. To this day, we are not aware of any issues that have occurred with our customers regarding cross contamination. Our labels, like so many products today, include allergy-related statements for the benefit of those with those specific concerns. We are unable to advise whether a product or an ingredient is safe to use with any medical condition. We suggest that anyone with a medical condition (including allergies, pregnancy, or nursing), that is undergoing medical treatment, or using or will be using a prescription medication consult their physician prior to using any Arbonne products in conjunction with them. This would also include anyone with sensitivities to certain ingredients. I hope that this information was most helpful to you. Thank you for your interest in Arbonne. We appreciate you! If you need additional assistance, please feel free to contact us by email or phone. We are here to assist you as follows (central time zone): U.S. 1-800-ARBONNE (1-800-272-6663) 8:00 am to 8:00 pm Monday through Friday and 8:00 am to 5:00 pm Saturday. Canada 1-888-ARBONNE (1-888-272-6663) 8:00 am to 8:00 pm Monday through Friday, 8:00 am to 5:00 pm Saturday (English) and 9am to 5pm Monday through Friday (French). So what do you think? Would you use Arbonne after reading this email? I would love to hear your comments below, but PLEASE no Arbonne sales pitches. They will be deleted! 2/10/2014 Update: Due to ambiguous nature of the response from Arbonne and the conflicting statements in the email above, I personally choose not to use Arbonne. This is my personal decision and I would appreciate if all of the Arbonne consultant hate mail would stop immediately! You are definitely not helping to change my decision with your nasty emails. A few weeks ago, when I first published my list of gluten-free bakeries in New York City, I was shocked by the backlash. I was attacked on Twitter by one of the bakeries who said the other bakeries I listed were not all gluten-free. I was really upset by all of these Tweets because my post was meant to be happy and celebrating all of the new gluten-free options for us in this city. This person came across as accusatory and quite honestly looked a bit jealous of the the competition that was now encroaching on their territory. My blogger friends rallied behind me and I knew there was nothing wrong in my post. I do my research. I put together my post based on all of the information available on each individual bakery website and press releases sent out by the bakeries themselves. I did not include bakeries that also produce gluten-filled goods. These were all 100% gluten-free bakeries. I was bothered that this person on the Internet was implying I was a liar. This Tweeter was relentless, specifically calling out Babycakes NYC for using spelt in their products. While this was true in the past, I remembered reading that Babycakes NYC stopped using spelt. I went to the source and I got my information from the Babycakes website and included them in my tweet. Babycakes NYC calmly responded to the negative tweets via Twitter and stated "We discontinued our spelt items a few months ago and have been 100% gluten free ever since. :)"
And then the comments and Tweets from others continued, continuously calling out Babycakes NYC. For those of you unfamiliar with Babycakes NYC, they have been a very popular destination bakery in New York City for years. They produce gluten-free goods such as cupcakes, cookies, and even donuts. In the past, they used spelt in their other products. Unfortunately, this wasn't the first time Babycakes was going through a bit of a gluten-free controversy. I wanted to clear up any confusion, so I went directly to the Babycakes NYC website. And then I started getting confused. On their menu page, the top line clearly says: "All items are dairy free, egg free, soy free, and gluten free." The same information is on their ingredients page. But if you dig around on their website, there are a lot of old pages (that are probably meant to be archived) which clearly state that Babycakes NYC uses spelt. I could understand why others were confused so I decided to go directly to the source. I emailed Babycakes and heard back in less than an hour. With permission, I am posting the exact response I received from the Babycakes NYC general manager. Thank you for bringing this to our attention. We stopped using spelt in our bakery late this spring and have updated our website as well. The link that states that we still use spelt is an old link that was accidentally left up on one page. We just deleted that link so that all of the updated information is available and correct through the website. After phasing out our spelt products, we deep cleaned our oven and kitchen area to make sure that there is no risk of cross contamination. We no longer use any of our utensils, bowls, cleaning utensils, measuring cups, and pans that were labeled spelt and have thoroughly bleached and deep cleaned the sink that was used for Spelt products. Thank you again for bringing this to our attention, all of the corrections to the website have been made. Please let us know if anything else comes up. Thank you and have a great day! From this response, it is seems to me that Babycakes NYC understands what needs to be done in a kitchen once a gluten-filled ingredient is removed. They appear to have taken all of the proper protocols to rid their kitchen of gluten to the best of their abilities. The most important thing is their transparency. Babycakes NYC responded to my Tweet immediately and to my emails in less than an hour. They agreed to let me post their response to all of my readers. I don't always find gluten-free companies that comfortable with full disclosure, but not Babycakes NYC. It is obviously still up to each of the gluten-free individuals if they want to eat at ANY of the gluten-free bakeries I mentioned in my post, but I really wanted to get the facts straight. I take my blog, and the health and safety of my readers, VERY seriously. I would never intentionally post false information. I applaud Babycakes NYC for their honesty and I thank them for being one of the soon-to-be SEVEN gluten-free bakeries in New York City. Please note: This blog post is only intended to report on the Babycakes New York City location. For any questions regarding their other locations, please contact Babycakes directly!! !